The old adage of “girls can do anything!” is inspiring and absolutely true! Girls can be whomever and whatever they put their mind to. At Launch we love to see a great mix of both young girls and young boys interested in STEM education and flourishing with it. We want to keep this eagerness in both genders alive. So, why do we bring this topic of females and STEM up? Great question. A recent article featured by Techcrunch showed a decline in STEM interest for young girls around the age of 12 years old that we wanted to share. We found this statistic interesting and also alarming. (Source: Techcrunch) Why are 12 year old females losing interest in STEM? While studies show that young girls often accelerate in their studies early on it is found that around age 12 their confidence in math and science begins to decrease. They struggle with their abilities in these subjects and this is creating a domino effect of underrepresentation of females in STEM driven careers later in life. 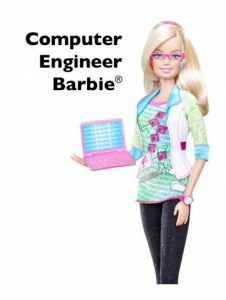 It seems as though others may be catching on to this stat… Does anyone recall recent attempts over the past few years to inspire young girls to seek interest in the career path of doctors, engineers or scientists like Mattel Barbies or ‘GoldieBox’ – studies are showing a need for this young female empowerment! Getting children of all ages, all genders involved and feeling confident with STEM is important and productive to their development. Making STEM “fun” which is something we focus on can also help with that extra confidence boost that perhaps some young girls may need. What are your thoughts on the roadblock of STEM for adolescent females and the impact it has on the future of this subject? We can’t wait to hear.